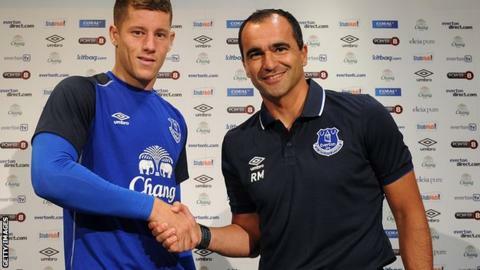 Everton boss Roberto Martinez has said that the club are still assessing how long injured midfielder Ross Barkley will be out of action. The 20-year-old suffered medial ligament damage in training on Friday. Martinez had originally voiced his fears that Barkley could be out for five months, but has now played down that estimate. "It could be anything between seven, eight, nine weeks going all the way to a longer period," said Martinez. The Spaniard, speaking ahead of Saturday's Premier League match with Arsenal at Goodison Park, added: "I am sure Ross will take the least time possible. "He is physically such a strong boy that he has recovered a lot quicker than we expected in the first few days. "Obviously the knee is still a little bit swollen so it is too early to know how long it is going to be." A long-term injury could rule Barkley out of England's Euro 2016 qualifiers against San Marino and Estonia in October. Barkley played in three pre-season games after returning from World Cup duty and his absence is a major blow for Martinez. He played 34 games for Everton last season, scoring six goals, and signed a new four-year contract at Goodison Park last month. Barkley was hoping to establish himself as one of England manager Roy Hodgson's first-choice players after making two substitute appearances and one start in Brazil during the summer. Speaking after Saturday's 2-2 draw at Leicester City, Martinez said: "Ross Barkley is a phenomenal footballer and we're going to miss him, there's no doubt about it," said Martinez. "The squad should be big enough to be able to cope with losing a player, but it's a disappointing moment when Ross Barkley was going to have a really big start to the season."